Wine is a drink that is experienced from the senses and the wine glass used also plays a role in this experience. If you choose the right white wine glasses, your guests will get to enjoy the full experience the wine offers. This means that you should know about the type of wine glass you are buying before you buy it. There is a difference between a white wineglass and a red wine glass but not many people may be aware that there are also different types of glasses for white wine. 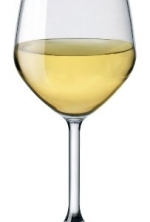 Chardonnay glasses are the most commonly used type of white wine glasses. This is because it is considered to be an all-purpose white wine glass. They are designed with a mouth that goes straight up from the side but they may narrow just a bit. The design lets the drinker taste the wine with center of the tongue which provides ultimate balance. These types of glasses are great for any dry and light white wine. Montrachet glasses were specifically designed for the most expensive dry white wine, the Montrachet Chardonnay. This wine type is full bodied and much more acidic than the standard chardonnay thus the glasses have a wider rim that is meant to direct the wine to all the edges of the tongue. This accentuates the wine's sour and more acidic flavors. The bigger bowl of the glasses lets the drinkers have a better experience with the seemingly complex aromas of this type of white wine. Montrachet glasses also come recommended if you are going to drink American chardonnay or Meursault wine. Sauvignon Blanc glasses come recommended for fruity white wines such as the Sauvignon Blanc. The glasses have a slim and slender bowl that directs the fruit and floral aromas of the wine while the narrow mouth directs the wine to the tongue's front. You may also use this white wine glass to drink wines such as Loire, Gewurztraminer or White Bordeaux. Since Champagne is commonly referred to as "sparkling wine" its glass also differs from the normal white wine glasses. 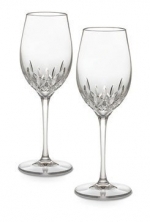 If you have ever been to an American wedding then you have definitely seen Champagne flute glasses. They are tall and narrow which allows the wine drinker to appreciate the entire experience of the carbonation in the wine. The drinker gets to watch the bubbles float to the glass top before they explode on the tongue. While standard wine glasses are clear, there are some more decorative glasses in the market that add some personality to them. You can also buy monogrammed white wine glasses for an anniversary or wedding that look quite elegant. For that unique look you can also go for black wine glasses. You may not be able to see the color of the wine but they can come in handy when it comes to blind testing. For those fun parties you may find some light-up wine glasses in the market. A small light is situated at the base of the glass making the entire glass glow.